Made of top-grade aluminium alloy. 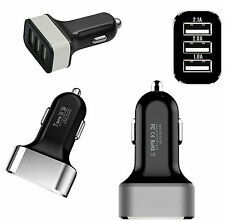 Plug into your vehicle's cigarette lighter socket, connect up to three USB devices in one go. Mini portable, easy carry with. We will work with you to until you are satisfied. Simply plugs into your existing cigarette lighter socket. Run two 12v devices from one socket. LED charging indicator. 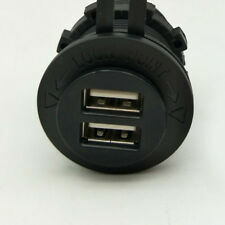 USB output DC5V-Max5.4V/500Ma. Includes 2 USB ports. Add to favs. There are no hidden fees on the advertised price. 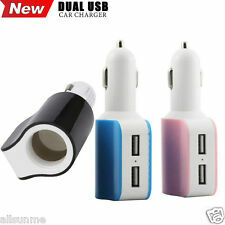 DUAL PORT USB 12V (5V OUTPUT). - Cable is not included. Plug and Play Item. Small,Compact,Sleek,Portable. Plug and Play. Two USB Ports. Blue LED Light ( Lights up when plugged in ). Universal USB port works with most USB cables. Plugs into any car power outlet. Material: Alloy ABS. 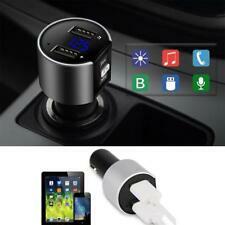 Single usb car usb adaptor 1AMP. - Patented circuit board designed to protect your valuable gadgets from any short circuits. (IPad, Tablets, USB Accessories and More) that can rely on USB for power! Input: DC 12V. Dual USB Port. Compact and Lightweight Design. Plugs directly into vehicle cigarette lighter. Small and lightweight for convenience, portability and storage. Simple and easy. If you have changed your mind or unsatisfied with your item. Stronger performance, lower cost. Smart IC chip inside. Input: 12~24V/DC. Feature: 1. Wide voltage design (12-24v wide voltage design, sedan truck general) 2. Super support (compatible with the common digital products in the market, suitable for mobile phone music player digital camera) 3. Streamline shape (perfect appearance, internal and external and repair, complement your love car) 4. Quick charging (intelligent power supply IC, stable current output without fluctuation) 5. 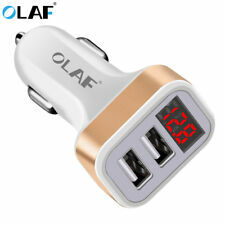 The safest car charger 6. 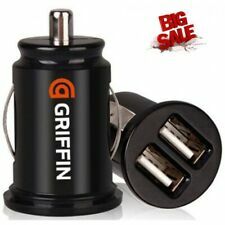 1 x Dual Car Cigarette Lighter Socket Splitter 12V 2.1A 1A. Wiring kit for cigarette lighters to install in any. USB Output Current: 2.1A/1A. Blue Light. 12V-24V motorbike, Boat, Riding mower, tractor or car. Product has overload, over current, short circuit protection functions, the power indicator light off when it start protection function. Power Bank. You can open the case, if we are unable to resolve the issue which won't be happening in 99% cases. 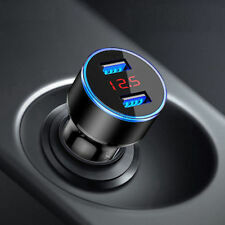 ·This socket is only used for car cigarette lighter. Triple Socket Output: 12V/5A (60W). 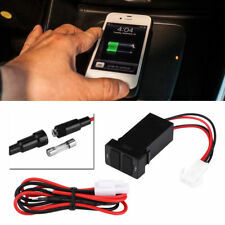 ·Better to unplug the power distributor from cigarette lighter while leaving the car. Here are our warehouse info. An extension of a cigar lighter, two USB port. Easy to use, plug and play, just plug it into your existing cigarette lighter socket. 1 x Car Cigarette Lighter Separator. Reinforced cigarette plug, to prevent from falling. Acigarette lighter socket for added convenience. Color: Black. This will help us to have a good standing. DC 12V / 24V input, compatible with most cars. Input: 12V / 24V. Item Located: United Kingdom. 100% Bran-new and Good Quality. 1 x User Guide. Besides, during the bluetooth connecting, play the phone’s music and the fm transmitter to car audio. The product with embeded echo cancellation micro phone, you can easily switch between music and phone calls. Works for all USB devices such as iPad, iPhone, iPod, other smartphones, tablets and etc. If Black or White is sold out any other colour could be sent out. Car cigarette lighter plug style with triangle bottom. Input interface: vehicle cigarette lighter ;. Double usb output, one key switch;. Output current: DC5V / 3.1A;. Output power: 80W ;. Glad to deal with you in the future. com, it just take a few minutes.